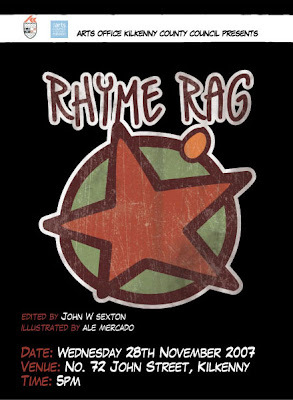 The new edition of Rhyme Rag is here. It will be launched on the 28th November 2007 in Kilkenny. This is the third year of the project and the third year I've been involved in it. Every new edition is a new challenge. Always pushing to offer the poems the edge and the energy they need, always pushing to get more and more people interested. I am really proud of beign part of it. I am also very grateful to Mary Butler for counting on me every time, and for the enthusiasm and energy she puts in the Rhyme Rag every year. Posted by Alé Mercado at 2:03 a.m. The cover turned out great. I do prefer the final one too.